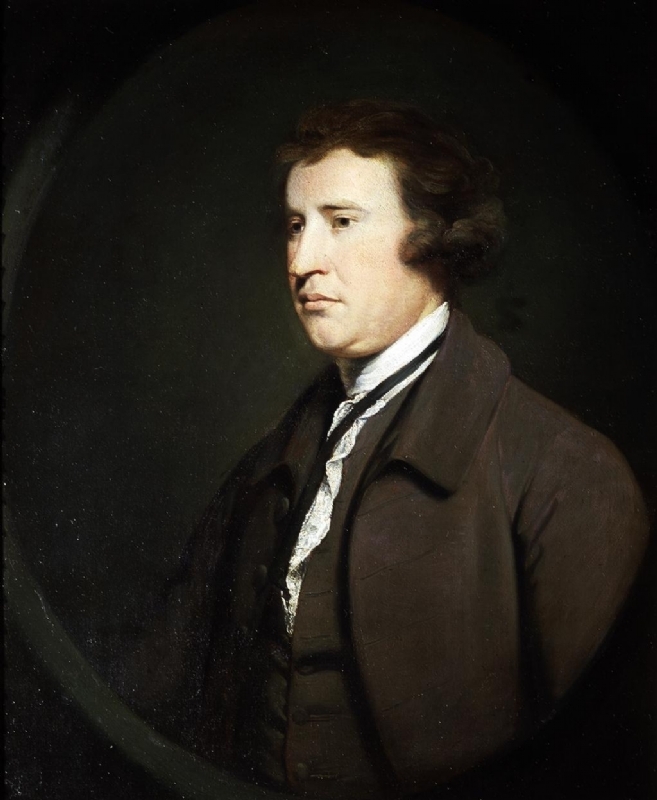 Edmund Burke was a famous Statesman from Ireland, who lived between January 12, 1729 and July 9, 1797. He became 68 years old. Edmund Burke was a British politician. He is considered the founder of conservatism. Burke belonged to the British party Whigs (a more liberal party than the Tories). Burke's ideas differ from other ideologies, since he really is not constructed any new ideology, he stated, rather than any principles (most of them have been standing) as descendants continued conservatism built on. The main work was to Burke Reflections on the Revolution in France (original title: Reflections on the Revolution in France) (1790). Burke was born in Ireland and later studied history. Burke supported, unlike most of his contemporaries countrymen, the American Revolution. He believed that it was the British king who had attacked Americans' rights. During the French Revolution a few years later, Burke (by many), however the opposite attitude. Now he was an ardent opponent of the revolutionary and participated in the so-called revolution debate. The changed attitude of Burke reasoned that the French revolutionaries, unlike Americans, they would overthrow the government and build something new. Such an attitude is contrary to conservatism because doctrines; evolution rather than revolution. Burke was particularly critical of the violence during the French Revolution. He is born under the zodiac capricorn, who is known for Determination, Dominance, Perservering, Practical, Willful. Our collection contains 78 quotes who is written / told by Edmund, under the main topics: Beauty, Religion. "All that's necessary for the forces of evil to win in the world is for enough good men to do nothing"
"All human laws are, properly speaking, only declaratory; they have no power over the substance of original justice"
"All government, indeed every human benefit and enjoyment, every virtue, and every prudent act, is founded on compromise and barter"
"A State without the means of some change is without the means of its conservation"
"A spirit of innovation is generally the result of a selfish temper and confined views. People will not look forward to posterity, who never look backward to their ancestors"
"A disposition to preserve, and an ability to improve, taken together, would be my standard of a statesman"
"In effect, to follow, not to force the public inclination; to give a direction, a form, a technical dress, and a specific sanction, to the general sense of the community, is the true end of legislature"
"You can never plan the future by the past"
"It is the nature of all greatness not to be exact"
"There is but one law for all, namely that law which governs all law, the law of our Creator, the law of humanity, justice, equity - the law of nature and of nations"
"People will not look forward to posterity, who never look backward to their ancestors"
"Our patience will achieve more than our force"
"Poetry is the art of substantiating shadows, and of lending existence to nothing"
"Nothing turns out to be so oppressive and unjust as a feeble government"
"The people never give up their liberties but under some delusion"
"It is a general popular error to suppose the loudest complainers for the public to be the most anxious for its welfare"
"Whilst shame keeps its watch, virtue is not wholly extinguished in the heart; nor will moderation be utterly exiled from the minds of tyrants"
"The person who grieves suffers his passion to grow upon him; he indulges it, he loves it; but this never happens in the case of actual pain, which no man ever willingly endured for any considerable time"
"Nobody made a greater mistake than he who did nothing because he could do only a little"
"In a democracy, the majority of the citizens is capable of exercising the most cruel oppressions upon the minority"
"Whenever our neighbour's house is on fire, it cannot be amiss for the engines to play a little on our own"
"There is a boundary to men's passions when they act from feelings; but none when they are under the influence of imagination"
"If we command our wealth, we shall be rich and free; if our wealth commands us, we are poor indeed"
"What ever disunites man from God, also disunites man from man"
"We must all obey the great law of change. It is the most powerful law of nature"
"Under the pressure of the cares and sorrows of our mortal condition, men have at all times, and in all countries, called in some physical aid to their moral consolations - wine, beer, opium, brandy, or tobacco"
"Toleration is good for all, or it is good for none"
"To tax and to please, no more than to love and to be wise, is not given to men"
"To read without reflecting is like eating without digesting"
"To make us love our country, our country ought to be lovely"
"To innovate is not to reform"
"Those who don't know history are destined to repeat it"
"The greater the power, the more dangerous the abuse"
"The first and simplest emotion which we discover in the human mind, is curiosity"
"The effect of liberty to individuals is that they may do what they please: we ought to see what it will please them to do, before we risk congratulations"
"The arrogance of age must submit to be taught by youth"
"Superstition is the religion of feeble minds"
"Society can overlook murder, adultery or swindling; it never forgives preaching of a new gospel"
"Slavery is a weed that grows on every soil"
"Sin has many tools, but a lie is the handle which fits them all"
"Religious persecution may shield itself under the guise of a mistaken and over-zealous piety"
"Religion is essentially the art and the theory of the remaking of man. Man is not a finished creation"
"Nobility is a graceful ornament to the civil order. It is the Corinthian capital of polished society"
"No passion so effectually robs the mind of all its powers of acting and reasoning as fear"
"Never despair, but if you do, work on in despair"
"Mere parsimony is not economy. Expense, and great expense, may be an essential part in true economy"
"Magnanimity in politics is not seldom the truest wisdom; and a great empire and little minds go ill together"
"Liberty must be limited in order to be possessed"
"Laws, like houses, lean on one another"
"Kings will be tyrants from policy, when subjects are rebels from principle"
"Justice is itself the great standing policy of civil society; and any eminent departure from it, under any circumstances, lies under the suspicion of being no policy at all"
"It is, generally, in the season of prosperity that men discover their real temper, principles, and designs"
"I have never yet seen any plan which has not been mended by the observations of those who were much inferior in understanding to the person who took the lead in the business"
"Hypocrisy can afford to be magnificent in its promises, for never intending to go beyond promise, it costs nothing"
"He that wrestles with us strengthens our nerves and sharpens our skill. Our antagonist is our helper"
"He that struggles with us strengthens our nerves, and sharpens our skill. Our antagonist is our helper"
"He had no failings which were not owing to a noble cause; to an ardent, generous, perhaps an immoderate passion for fame; a passion which is the instinct of all great souls"
"Good order is the foundation of all things"
"Frugality is founded on the principal that all riches have limits"
"Free trade is not based on utility but on justice"
"Flattery corrupts both the receiver and the giver"
"Falsehood is a perennial spring"
"Facts are to the mind what food is to the body"
"Example is the school of mankind, and they will learn at no other"
"Education is the cheap defense of nations"
"Custom reconciles us to everything"
"Circumstances give in reality to every political principle its distinguishing color and discriminating effect. The circumstances are what render every civil and political scheme beneficial or noxious to mankind"
"By gnawing through a dike, even a rat may drown a nation"
"But what is liberty without wisdom, and without virtue? It is the greatest of all possible evils; for it is folly, vice, and madness, without tuition or restraint"
"But the age of chivalry is gone. That of sophisters, economists, and calculators has succeeded; and the glory of Europe is extinguished forever"
"Beauty is the promise of happiness"
"Beauty in distress is much the most affecting beauty"
"Applause is the spur of noble minds, the end and aim of weak ones"
"Among a people generally corrupt liberty cannot long exist"
"Ambition can creep as well as soar"